Labii ELN & LIMS vs Benchling, Which one should I choose? I wrote an article about Comparative Analysis of Labii ELN & LIMS and Benchling Software Platform, this blog covers all details of that article. Benchling, the data management and collaboration platform built to advance life sciences research. Both companies are startups and are only existing for a few years. 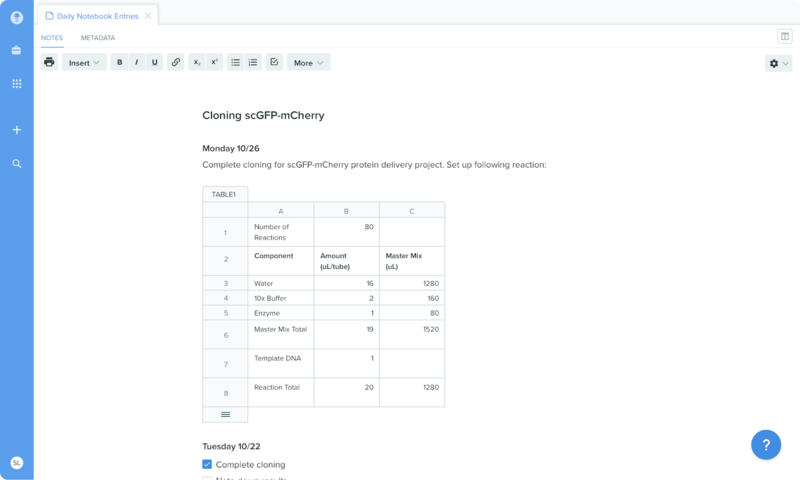 Benchling builds 6 different products (Lab Notebook, Molecular Biology Suite, Bioregistry, Sample Tracking, Workflow Management, Request Management) to serves 6 different requests in the laboratory. Labii is more flexible, Benchling is more specific. It is designed to meet the diversity requirement of all research lab and can be used for all industry fields. For example, a biotech company, mining company, agriculture farm. It is specifically designed for biological experimentation. For example, research labs from Bioscience Department of a University. Labii is designed for all industry, Benchling is designed for biological sciences only. Labii is centralized around the organization, all data created belong to the organization. Benchling is centralized around personal, the user has the freedom to set data as personal or organization. If you as an organization, prefer full control over the data generated, use Labii. If you as a user, prefer freedom on where to put data, use Benchling. One account is one organization. The organization can create members. The user can NOT join an organization. One account is one user. User information is public, an organization can search existing users and add the user. Organization information is public, the user can search existing organization and request to join. If you as an organization, prefer full control on your users, use Labii, otherwise, use Benchling. If you as an organization or user, concern about your organization or personal information, use Labii, otherwise, use Benchling. Permission is defined at the project level, users can only view/edit the records they are permitted. Permission is defined at the project level for shared projects. Users have full permission on personal data. If you as a organization, prefer full control on your users, use Labii, otherwise, use Benchling. Both are easy to create. Labii has higher IP protection and permission control, the project that the user can contributed is restricted. Benchling provides more freedom to users to create their own folders/projects. Add -> Experiment (plus button on right) -> Select a template -> Update the form -> Submit. Oops, I could not find this function. The operation for Labii to add a template is similar to add an experiment, but the function is obscured for new users. Unlimited number of sections can be added to a record. Each section works like an app in your smartphone, and can hold any type of data as different widget choosed. Use Text widgets to document free text, use Table widgets to create a editable table, use Files widgets to preview files, use Signature widgets to sign the documents, et.al. All column data, including metadata, is managed via the Column Data widget. There are ~30 widgets publically available, Labii is continually developing more widgets to meet research needs. They also provide services to develop custom widgets to meet the customer’s specific requirements. Each entry has 3 modules: Protocol, Notes, and Metadata. Use protocol to reference a protocol. Use notes to document any free text, table, or files. Use metadata to record other values. Labii is designed for advanced users, who want to use ELN to perform tasks more than note taking, like data analysis, tracking the usage of samples. Labii is extendable for new functions. Benchling is for the users who familiar with word documents, and only need to write down what they did. Add a Signature widget to sign and lock the experiment. Send for review to sign. Paid users only. Benchling provides management of Registries, Samples. If you need to manage inventory or other type of data, use Labii. If you need to manage sequences registries use Benchling. Widgets are available to record how much samples/reagents are used in an experiment, and to show the consumption history of a sample/reagent. Structure processes from discovery to bioprocessing to track progress, eliminate bottlenecks, and power better research decisions. All documents is managed at the Files table. No Document management portion is available. The request can be done via custom columns and tasks. Request Management streamlines every step of the request fulfillment process — from scheduling and documentation to tracking and reporting — and enables teams to manage resource allocation in real-time. Labii is very secure but less convenient. You need to relogin after 30 minutes of inactive. Benchling is more convenient but less secure. Tested on Aug 2018: I am able to get a response from Labii within one hour. I did not not get a reply from Benchling after 24 hours. Free for academic with limited functionalities. If you prefer simple functions and do not have any budget, use Academic plan of Benchling. If you prefer advanced functions and willing to pay a few buckets, use PPU plan of Labii. Labii is good for organizations that value their research data, and who seeking better solutions in ELN to resolve research bottleneck. Labii is a new innovative ELN that is different to any existing products. Scientists who only familiar with Microsoft Office is not comfortable with the complexity. Benchling is good for users who prefer word-like interface as ELN, and who need easy-to-access molecular tools. Both platform are designed to meet the needs of their customers. Labii is designed for organizations, while Benchling is designed for end-users. User should select based on their own preference, there are no such things as one is better than the other. Benchling is well-known, Labii is seldom known. While as a scientific tool, this only means Benchling has more capital in marketing and they are doing a great job in selling their products. It is still too early to say which product will dominant the ELN industry in the future, but I have faith on Labii. ii. A majority of the articles cover just the surface of ELN utility and fail to touch the functionalities in detail. iii. Most of the articles are paid articles which only mention the products of the vendors who paid for them. As an industry expert and founder of an ELN, I’m closely in touch with over 300 biotech companies/labs and will like to provide a unique comparative analysis of Labii and Benchling. I’ll cover details on Development, IP, Customers, ELN, LIMS, Security, and Price. With headquarters in San Bruno, CA, Labii Inc. is a software company which focuses on the development and distribution of ELN and LIMS. Our Labii ELN and LIMS provide flexible solutions to all research data management challenges, with the unique capacity for high-level customization according to the type of data to be stored (notes, protocols, reagents, etc. ), the data attribution, and the detail of each record. 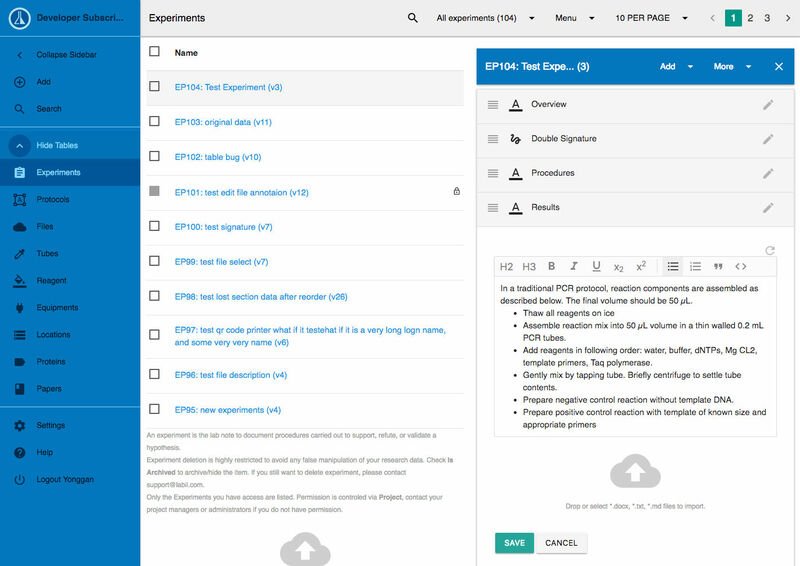 Relatively new to the scene as well, the Benchling data management and collaboration platform are more specifically designed for the advancement of research in life sciences. There are six different Benchling products (Lab Notebook, Bioregistry, Molecular Biology Suite, Sample Tracking, Workflow Management and Request Management) which serve for six different laboratory requests. Both companies have existed for just a few years and tackle data management in different ways. Labii is structured for entire organizations who intend to own and control all created data. Each account represents one organization which is allowed to create members with user information regarded as private. Users can’t join the organization and all information including that of the organization is private. Benchling is more centralized for personal use. Accounts are for users who are free to set data as personal or organization. User and organization information is public which means, organizations can search and add existing users. Also, users can search and request to join existing organizations. These properties make Labii the ideal platform for organizations looking for complete control over the activities of their users. Also, if your organization is concerned about its information and personal information from its users, use Labii. Benchling will be perfect if none of these issues disturb the functioning of your organization. Tailored towards the diverse requirements of all research laboratories, Labii can be used by companies in all fields of the industry; biotech, mining, agriculture, etc. On the other hand, the design of Benchling supports biological experimentation best, making it particularly suited for Bioscience research labs in Universities, and so on. With Labii ELN and LIMS, permission is defined at the level of the project as users are only permitted to view/edit specific records. This is not particularly so with Benchling as permission is defined at the project level for shared projects but users have full control over personal data. Creating an ELN experiment is easy with both Labii and Benchling. Labii just has higher IP protection, and permission control, offering restricted contribution to users. Meanwhile, users are free to create their own folders/projects on Benchling. Templates can be added on the Labii platform with the possibility of adding records from templates . I didn’t find this function while testing Benchling, but I believe it’s available and I just couldn’t find it. 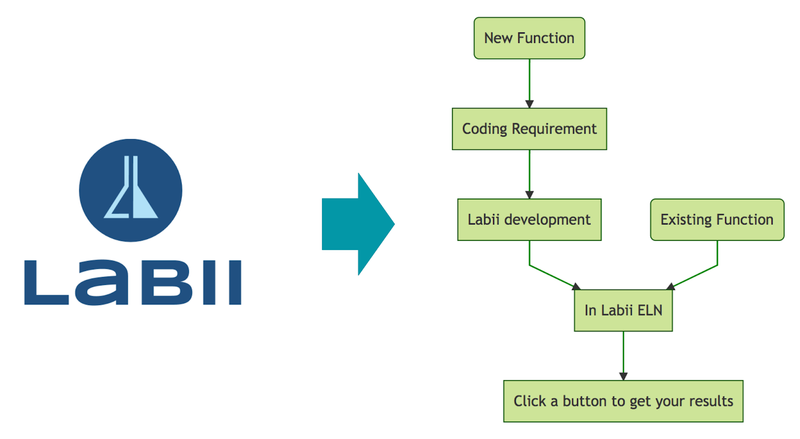 The versatile and extendibility properties of Labii are very much expressed in the possibility of adding unlimited number of sections to a record. Opposed to Benchling’s 3 standard modules; Protocol, Notes, and Metadata (respectively used to reference protocol, document free text, tables or files, and record values), Labii ELN helps users go beyond note taking with advanced functions like data analysis and sample usage tracking. Each section of an experiment on Labii works like a smartphone app which can hold any data type according to the widget selected. Text widgets can be used to document free text, table widgets for the creation of editable tables, file widgets to preview files, signature widgets to sign documents, Column Data widget for the management of all column data, etc. In addition to the 30 publicly available widgets, Labii is constantly working to develop more widgets to meet other research needs. We also help develop custom widgets for our customers to meet their specific requirements. Labii ELN and Benchling both meet the standard requirements of GLP and FDA 21 CRF part 11. And our platform offers Blockchain enhanced Version control and Activity Tracking. At Labii, we provide full LIMS which store virtually any type of data including; Samples, Equipment, Reagents, Locations, etc. Custom tables can also be created for other specific data types like Cell lines, Proteins, Plasmid, etc. Molecular tools, recording of consumption history for samples/reagents, and Data analysis are available with the use of widgets. Contrarily, Benchling only supports the management of Registries and Samples. However, processes are structured from discovery through bioprocessing to track progress, eliminate bottlenecks, and drive better research decision. Similar LIMS workflow management facilities are still on alpha testing with Labii. Benchling’s molecular tools are more sophisticated, as paid customers are delivered the version with gene editing and CRISPR. With much more security guarantees and slightly compromised convenience, Labii ELN and LIMS safety is owed to our Account Lockout Policy and excessive session timeouts which require users to log in again after 30 inactive minutes. Failed Login Reports, Encrypted Traffic with HTTPS, Daily Backup, Content Security Policy (CSP), Periodic Vulnerability Testing, X-XSS-Protection Header all contribute to our unique security. The lower security guarantees of Benchling source from industry encryption and regular back-ups. Annual Labii subscription costs $960 per user and $0.1 per record for the Pay-Per-Use option. Our team responds to support tickets within 24 hours and there is immediate assistance with Paid Support. Benchling with limited functionalities is free for academic missions and the annual subscription for the full software costs $1250. The Benchling Academic plan would be perfect if you have no budget and only need a few simple functions. If you need advanced functions and can afford a few bucks, then the Pay-Per-Use plan of Labii looks more like it. The customization aspect, capacity for extended functionalities, full permission control and IP protection of Labii are strong data management advantages with the stand out pros of Benchling being its simplicity, sophisticated molecular tools, and free option. It’s important to note that despite the many advantages, the Labii software platform requires more learning. We can, therefore, conclude that Labii is perfect for organizations that value research data security and are looking to exploit our new innovative ELN and resolve research bottlenecks almost all the other existing products can’t handle. Meanwhile, Benchling is one of the best options for end-users who prefer a simple word-like interface as ELN and need easy-to-access molecular tools. Benchling is currently more popular. However, no one can say with outright certainty which of these two will dominate the future of the ELN industry as Labii is a uniquely effective scientific tool with the unrivaled potential. Detail of notes are available at Labii ELN & LIMS vs Benchling, Which one should I choose? ELN is an acronym for Electronic Laboratory Notebook. It is a software program that, in this day and age, has replaced a traditional paper laboratory notebook. A laboratory notebook is one in which scientists, engineers, and technicians (bench scientists) record their experiments and research. All the steps and procedures that they use, the theory that led to the research in the first place, the basis of the theory, the result has gotten and the conclusion arrived at. All are recorded in a lab notebook which the ELN is the digital version of. The ELN has all the benefits of the traditional paper notebook and more. For one, it makes searching easier. Content, values and other data can also be easily copied, pasted and backed up. Collaboration within the scientific community is also made easier, faster and more convenient all via the ELN. So far, ELN is sole designed to meet the requirement of bench scientists. A bioinformatics scientist is one who uses the opportunities afforded by information technology and the computer to study, analyze and process biological information. Science has greatly progressed over the years and has gotten to a point where there is a lot of information available on things that were initially obscure. This has led to complexities and entanglements where using these data and information are concerned so much so that collecting, storing, analyzing and managing them is almost impossible without digital help. This help is what bioinformatics scientist provide to the scientific community via the use of computers and information technology. What bioinformatics scientists do is study and analyze massive amounts of data gotten through research. They do this on a minuscule level such as proteomics (which is the use of molecular biology, biochemistry and genetics techniques to study proteins on a molecular level), genomic sequence data and the likes. 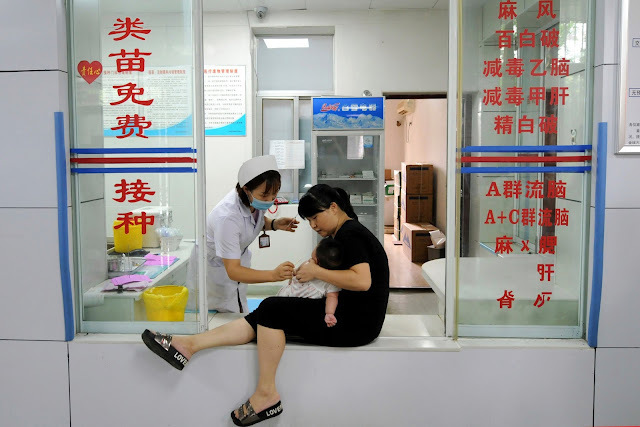 Genetic information is collected, analyzed and stored for scientific purposes by bioinformatics scientists. These can then be retrieved at a later day and age by those who require them. They also develop, design and tweak the software programs that are required to get this work done. How bioinformatics scientists do their work is through the writing and development of codes for the analyzation of data. They are part programmer and part scientist. However, given the nature of work that they do, documentation is more or less impossible. Until now, no concrete solution existed as how bioinformatics scientists will document and record their work. Most just utilize some quite simplistic methods that are inadequate to say the least. There hasn't been a way for them to keep track of whatever changes they make to their codes, no way to document the problems that arise during the writing and execution of their software programs and how they went about solving that problem. This has made the work of bioinformatics scientists hard, and strenuous. It has also stifled collaboration in that their works cannot be easily reproduced by peers in other places. Use of a “read me” text file which explains and lays out the aims and objectives of the project. It is also used to keep track of whatever development and update they make to their document for reproducibility purposes. Some bioinformatics scientists use private wikis to keep track of and record their work and whatever progress they make on it. The wiki page can then be made accessible to other collaborators on the project. Version control software programs (such as GIT and SVN) are also used to keep track of changes to scripts and recorded datasets. Use of a script (such as a .bash script) to record the steps taken in the development of said program. What this means is that data collated and documented by bench scientists are not easily accessible to bioinformatics scientists. When they do get the data, and perform their analysis, bench scientists also find it a struggle to track the analysis results of the data. However, Labii has come up with a solution which is an ELN that allows bioinformatics scientists to do their analysis directly in the ELN. This is done via the use of function specific widgets that allows you to get more work done as a bioinformatics scientist. Labii ELN and LIMS extends the ELN functionality via the use of widgets that are required to meet the specific needs of your ongoing research. A widget is an independent application that is capable of performing a certain and singular function. In other words, bioinformatics functions can be add to a widget and can perform the bioinformatics analysis directly within Labii ELN & LIMS. The Labii ELN and LIMS utilizes widgets to allow you get more functionality from them by allowing you to dedicate your ELN and LIMS to only those particular functions that are needed to accomplish your project. For instance, most electronic laboratory notebooks come with fixed solutions which require that the intending user goes through several ELN’s looking for a particular one that meets his/her needs. If another project is needed to be done, that means that yet another ELN would have to be purchased. Labii widgets allow you to do bioinformatics data analysis that you could ever do before and is promising to change the face of reporting in ELNs and LIMS. It offers a cheaper alternative to outsourcing: Any scientist who has ever outsourced analysis of data knows that you pay for the analysis every single time you want them analyzed even if they are identical. Labii eliminates this need. If you need to analyze a particular set of data which are similar more than once, (which relates to you needing a particular functionality more than once), all you need do is contact us at Labii and we will develop the code for you. You can then put this code in your ELN and use for as many analysis as you require. You only pay once and that is for the code development and the memory hours required for each running of the code. This helps you save a lot of money that you would have otherwise spent in outsourcing the analysis of your data. A fast and quick turnaround time: when you outsource analysis of your data, it more often than not requires a long amount of time than you would normally appreciate and require. However, with Labii, you get to drastically reduce the length of time required for you to get your results. Some analysis takes as little as a few seconds for the result to be generated. This bodes well for you as you get to work faster and more efficiently while saving a lot of time. Easier and better collaboration: using Labii ELN and LIMS allow different bioinformatics scientists as well as bench scientists to work on the same platform and thereby stay on the same page. Metadata created by bench scientists in the course of the research can be handed over directly to other scientists (data scientists) via the Labii LIMS. This translates to faster and better communication and therefore, better and more efficient collaboration across board. Better documentation of procedures and steps: Labii affords the bioinformatics scientist to better document their work. Every running of the program, every parameter that is input, every change made and logging in done (who logged in and other pertinent information) is well and properly documented for future purposes. In all, the Labii ELN (electronic laboratory notebook) and LIMS (laboratory information management system) is an essential tool that every bioinformatics scientist should possess. This is because it renders the work of a bioinformatics scientist easier and makes it faster. If you are interested in doing a better, faster and more efficient work, then reach out to Labii at https://www.labii.com/contact-us/ and we will gladly help you fulfill your needs. You can also get a demo of our services at http://schedule.labii.com.